A resident of Tucson since 1958, Dan Schneider is a 1960 graduate of Rincon High School and was an All-City and All-State baseball player there. He was a first-team All-American at the University of Arizona before signing a bonus contract with the Milwaukee Braves in 1962. Dan played professional baseball for 10 seasons, five of which were in the major league with the Braves and Houston Astros. In 1991, upon the exit of the Cleveland Indians from spring training here, Dan was appointed to head a community group in finding a replacement. The group was very successful in attracting the Colorado Rockies to Tucson. As president of the Southern Arizona Sports Development Corporation (SASDC, a private non-profit organization), he has led the expansion efforts of spring training. 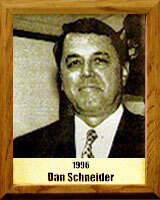 Dan, who is chief financial officer of Schneider, Bulua, Talerco, Inc., an insurance and financial services company, also has been involved with youth baseball as Little League coach, league president, commissioner of Big League and assistant district administrator.